Taylor Withrow aspires to be an influential and compassionate lawyer — to stand up for what is right and to be the voice for people who lack one. At UGA, she has had the freedom to dive into her interests and make an impact on campus. First Dawg in my family!! 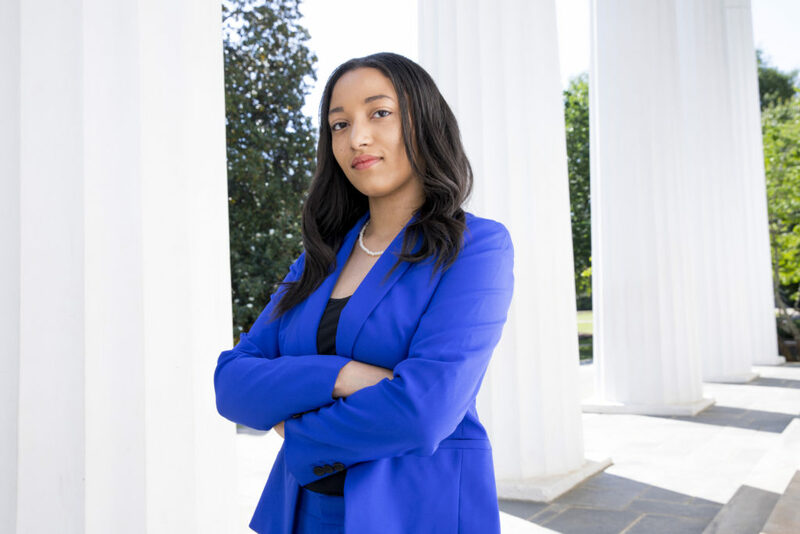 At UGA, I have had so many remarkable opportunities to explore my interests in law, criminal justice, and civil and human rights. These opportunities first presented themselves before I was even a UGA student when I was invited to attend the 2015 Center for Undergraduate Research Symposium as a CURO Promising Scholar. It was incredible to see so many students pursuing interests in various different fields and I was given that same opportunity when I was later offered the CURO Honors Scholarship. As a CURO Honors Scholar, I spent the first week of my freshman year meeting with different professors in various different departments discussing research opportunities. I was fortunate to begin my own research project with Valerie Babb in the English department studying the identity development of multiracial individuals and the role race plays in social institutions such as education, employment and criminal justice. My research allowed me to focus more on civil rights and further piqued my interest in the criminal justice system. The summer following my freshman year, I interned at a defense law firm confirming my career goal of becoming an attorney. Throughout my sophomore year, I continued to do research studying racial identity development while looking for more opportunities to get involved on campus. I was then selected to be a part of the inaugural class of the Leaders Engaged In Affirming Diversity Fellowship with the Office of Institutional Diversity. As a LEAD Fellow, I was able to work to model diversity leadership and promote diversity awareness on campus. This past semester, I have been an intern for the Office of Institutional Diversity working on implementing projects and initiatives to promote inclusion and diversity on campus. I was also selected to be a part of University Judiciary, the student-run organization charged with upholding the Code of Conduct by proactively educating our community and by administering formal hearings for students alleged to have violated the code. Judiciary has afforded me amazing opportunities to serve the UGA community and grow as a student and a leader. I have been elected to serve on Judiciary’s Executive Council as the director of recruitment and development for the upcoming school year, and I am incredibly excited to continue my journey in this organization. During my sophomore year, I also had the opportunity to be a teaching assistant for the Honors Program in the first-year Introduction to Honors course. I absolutely loved being able to mentor other students, and this experience encouraged my interest in mentorship, teaching and education policy. Fortunately, I was able to continue as a teaching assistant for the CURO Honors class during my junior year. As a CURO teaching assistant, I have been able to not only mentor but also learn from some amazing first and second year students doing fascinating research as part of CURO. As the director for recruitment development, I am looking forward to being able to be a teaching assistant again this time assisting in teaching, training and mentoring a new class of Judiciary members. Through the Honors International Scholars Program, I spent the summer following my sophomore year studying abroad in South Korea. While abroad, I studied comparative law and legal studies, but I really spent most of my time exploring Seoul! When I came back from Seoul, I jumped right back into school by continuing my research, serving on Judiciary hearings, mentoring CURO students, but I also began to explore more of my interests in education, criminal justice and public policy. I was selected to be a part of Leadership UGA, a selective program that provides students a unique opportunity to interact with leaders across the state of Georgia, while also learning about and supporting efforts to create positive change in Athens. I also was selected as an Experience UGA ambassador, a program that partners with the Clarke County School District with aims to bring every Clarke County student to UGA’s campus every year. Finally, I also started volunteering with the Georgia Innocence Project, a nonprofit working to exonerate the wrongly convicted, help the exonerated rebuild their lives, and to educate the public about the prevalence of wrongful convictions. As part of the Honors in Washington Program, I worked in D.C. this summer at the American Bar Association as a public interest intern. And this fall I’m beginning a new research project working with associate professor Christina Boyd exploring federal trial court appellate review of denied Social Security Administration disability claims. Through these incredible opportunities and other honors like the Zell Miller Scholarship, the OneUGA Scholarship, Honors International Scholars Program, Honors in Washington, the CURO Honors Scholarship, induction into Phi Kappa Phi and Omicron Delta Kappa, the last three years have been an amazing experience and look forward to my last year! Honestly speaking, when I was in high school, UGA was not my first choice for college. But during my junior year in high school, I came to visit UGA and I just felt at home. I then was able to visit UGA while interviewing for the CURO Honors Scholarship, and I realized that UGA was the steppingstone for my career, my aspirations and my dreams. At UGA I would have the freedom to dive into what interests me most while still being able to explore countless other disciplines. 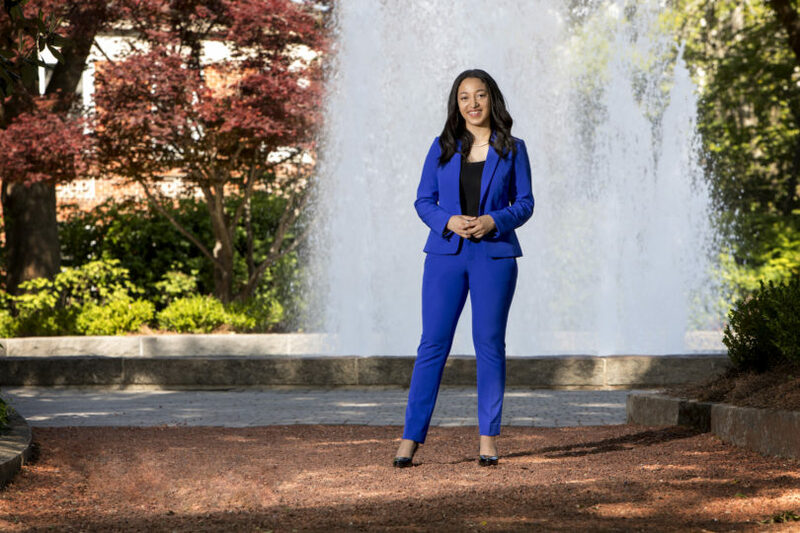 From the moment I stepped onto UGA’s campus, I knew I wouldn’t be just another student, a number or a face in the crowd. I would be a student with a name with goals and aspirations; I would be a part of the UGA family. When I’m stressing over tests or papers, I love hanging around North Campus and spending time with friends. My free time usually consists of me trying to get ahead on schoolwork, but when I am not doing anything related to school, I really enjoy arts and music. As a way to lower my stress level, I really like to paint and draw so my room is slowly filling up with paintings because I have no more wall space to put them up. Since I am unfortunately running out of room to store my paintings, I have turned to my other hobby, which is playing the piano. Before I got to college, I used to play almost every day, but I still like to head over to the Hodgson School of Music to play the piano in their music rooms. This is a hard question as there have been so many faculty and staff at UGA who have made an incredible impact on my college journey, but I’d like to give my thanks to professor Valerie Babb who is my research mentor and gain amazing guidance throughout the past three years. I am also super thankful to Christina Boyd who taught “Supreme Court Politics” last semester. Dr. Boyd does an amazing job of presenting the material and involving students through projects and simulations. I am also excited to work with Dr. Boyd this semester on her research project studying Social Security Administration disability claims. I also could not have had such a great experience here at UGA without the Honors Program and its staff. Specifically, Maria de Rocher who spends countless hours helping students prepare for internships and studying abroad and who has personally spent time going through my resume, cover letter and writing samples. I honestly don’t know if I would have gotten an internship in D.C. without her! I’d also credit David Williams and Maria Navarro as part of the CURO Honors Scholarship and the incredible mentorship and support they have provided me over the past three years. I would definitely spend an afternoon with Thurgood Marshall, who is my idol and arguably one of the most prominent attorneys in U.S. history. Thurgood Marshall dedicated his life to using the law to fight for equality and justice for all and I aspire to be as an influential and compassionate lawyer as he was. … get nominated to be a Supreme Court justice. I’ve always had a borderline unhealthy obsession with the law and have spent last 15 years of my life waiting for the day I could go to law school. My love for the law led to my incredible respect for the Supreme Court as an institution that will uphold the law above all else and ensure justice and equality in our society. … travel both domestically and internationally providing legal services to those who need it, most specifically in areas of civil or human rights and criminal defense. My passion is ensuring the rights and liberties of all persons while promoting equality and social justice. From an early age, I knew that I wanted to be a lawyer so that I could stand up for what was right, to be the voice for people who lack one. … go abroad to teach English for a year and then head to law school! My freshman year, I got to meet Alice Walker, who is a novelist, writer, poet and an activist for civil rights and feminism. Meeting her was such an incredible experience and encouraged me to continue to pursue my interests in civil and human rights.